Statistics. On average, a tropical storm, or its remnants, can be expected to impact the Old Dominion yearly, with hurricanes expected once every 2.3 years. These averages are competitive to what is seen down south along the Gulf coast, even though major hurricanes are far more rare. The chart below breaks down the tropical storm and hurricane distribution by decade starting at 1851...the year the hurricane database begins for the North Atlantic, Caribbean Sea, and the Gulf of Mexico. Tropical storms and hurricane categories before 1886 were determined by damage done across the area. Surprisingly, some of the most active decades for Virginia were during the "Little Ice Age", a period of global coolness, that lasted from around 1870 to 1900. One would expect more storms to impact the state during warmer years than cool years, but this is not the case. From the graph above, there appears to be a fifty year cycle in the number of tropical storms and hurricanes in and nearby Virginia. The peak of the cycle tends to last around 15 years. Movement. In most cases, tropical cyclones have moved, regardless of the month, from southwest to northeast across Virginia. There are some examples were storms crossed from east to west or vice versa, but that is quite uncommon. To the lower right is a map showing the tracks hurricanes have taken past Virginia Beach during a 111 year period. The mean forward motion of tropical cyclones through the area is 17.3 knots...or 20 mph. This is normal as tropical cyclones round the western periphery of the Azores- Bermuda High which dominates the flow across the Atlantic during summer months. 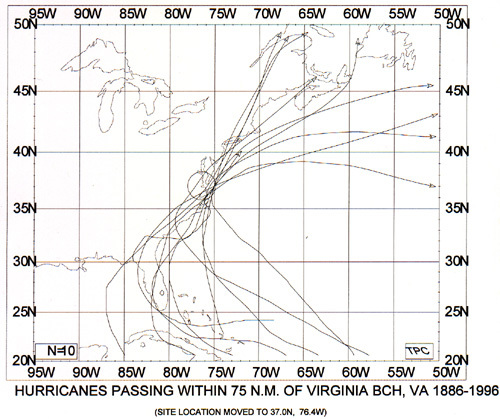 To the lower right shows the distribution of translational speed past Virginia Beach, courtesy of the National Hurricane Center. are concentrated near the lower coast. mainly in the area around Norfolk. along the Gulf or South Atlantic coasts. Hurricane (1933), and Hazel (1954). while Norfolk experienced gales 46 years. Rainfall. The most common effect of a tropical cyclone passing by Virginia is its associated rainfall. The heaviest rain in a truly tropical cyclone, outside of terrain effects, occurs to the east of the track. However, many systems that pass this far to the north exhibit some non-tropical characteristics, such as cold/dry air wrapping around the west and south sides of the circulation. When this happens, the rainfall distribution changes markedly. The maximum rainfall can then be expected to be just west of the track, and well to the east, outside the reach of the dry air. Severe weather, such as microbursts, tornadoes, and hail tend to be more common with this dry air intrusion, mainly to the east of the track. 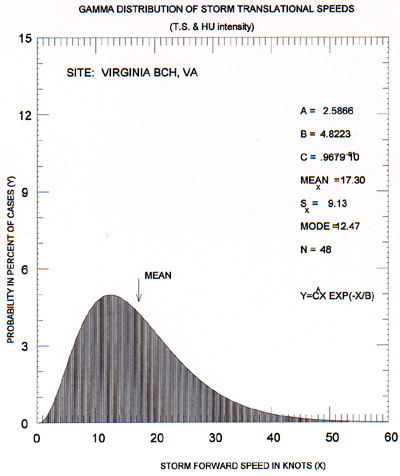 To the lower right is a chart of the ten highest rainfall amounts, in the Old Dominion, to be measured in association with a tropical cyclone. flooding and landslides in that region.